Master of the incredibly long show title, Stuart Laws has not let us down at this year’s Edinburgh Fringe with the rather convoluted but marvellous So Preoccupied With Whether or Not He Could That He Didn’t Stop to Think Whether He Should (1hr Show) at the Pleasance. Yep, it’s going to be real easy. Last year I had an emergency appendectomy three days before I got there, the year before I had shoulder surgery three weeks before I got there so this year should be a walk in the park. Unless I get struck down by something else at this late stage. Imagine if I did! Can you imagine it? And people would say: you shouldn’t have tempted fate, but you know what? I will suffer no health complications or have to endure any surgery before Edinburgh this year. See you in Scotland. Very closely. Mainly because the blurb is very short due to an incredibly long show title. Don’t charge money to come in to the show. Has really helped me get good audiences the last few years. So this year I’ve decided to play at venue that insists people pay money to gain access to your show. I have 55 tickets to sell each day, 1430 in total. If we could all tell 3 friends and they tell 1427 friends I should be ok.
[James] Acaster, [Nish] Kumar, [Rose] Matafeo, [Annie] McGrath, [Woody?] Allen, [Joel] Dommett. We’re going to be watching all the Oscar-winning best films of the last 30 years. One a day. I can’t wait for The Silence of The Lambs. Everyone I’m living with, they’re all very funny people and all have supremely funny shows, I’ve seen early stuff of all of them. Add in Matt Winning who has bitten off a huge amount and will then chew it successfully in a show that promises to be brain-meltingly funny. 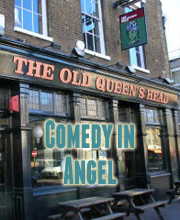 Harriet Kemsley is great, Athena Kugblenu is very funny, Lou Sanders is always brilliant, Patrick Turpin has got a really mad, unique show that I really laugh at. Anything from any of the Weirdos. There’s a sketch show called I Am Wario that seems to be the most audacious, stupid thing that anyone has ever attempted. Going to swim most days. Also hoping for another Broadway Baby review. Psychopaths can be ruthless in pursuit of their goals, lack empathy and do not process other people’s emotions. They evaluate everyone in terms of who is a threat to them and who they can use to help them achieve their goals. They see no problem with taking the credit for other people’s work, lying, passing on blame or treating people unfairly. Rage, rage against the dying of the light.